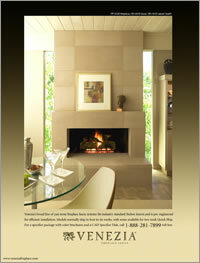 In 2003, NVCS Cast Stone Systems was a regional maker of one–of–a–kind custom products. NVCS’s best opportunity for a more profitable catalog line lay with fireplace surrounds, since they’d already made enough molds for custom products. Others offered similar products, but none looked like industry leaders. We named the line and gave it a logo that might have been carved in stone in Venice. Some competitors had higher ad budgets, but their ads weren’t at a taste level worthy of the product category: the literacy and photographic standards of high–end shelter magazines. We started with a top photographer and a top stylist and stepped out like the leader of the pack. After six months, sales were up 64% over the previous year. NVCS moved to a new plant down the road with double the manufacturing capacity.